LOCATION This extended family home is set in an appealing residential road, in the popular village of Broadbridge Heath, to the west of Horsham’s historic town centre. Here you will find a wide variety of shops and restaurants, together with the main line railway station with its direct service to London Victoria. The village is also perfectly positioned for local amenities, such as The Shelley Arms, a convenience store, hairdressing salon, Shelley Primary school and Tesco Extra. In addition, the house is within a short walk of Tanbridge House School and provides excellent road access to the M23/A23, Guildford, Billingshurst and surrounding villages, including the picturesque Warnham & Slinfold. PROPERTY The front door opens into a bright, well decorated Hall, which provides the ideal space to remove your shoes before stepping into the house and has space for a desk under the stairs. From the Hall, stairs lead to the First Floor and doors open to the Living Room, Kitchen Diner and Bedroom 4/Study, which benefits from an En Suite Shower Room, but could also be used as a Family Room for the children to play. The Living Room, which has a large window to the front, has a modern wood burning stove, plenty of space for a number of sofas and double doors opening in to the extended Kitchen. This beautiful room boasts maximum measurements of 20’2 x 15’2, has a vaulted ceiling with three skylights flooding the room with natural light and is fitted with a stunning range of floor and wall mounted units, with a central island. 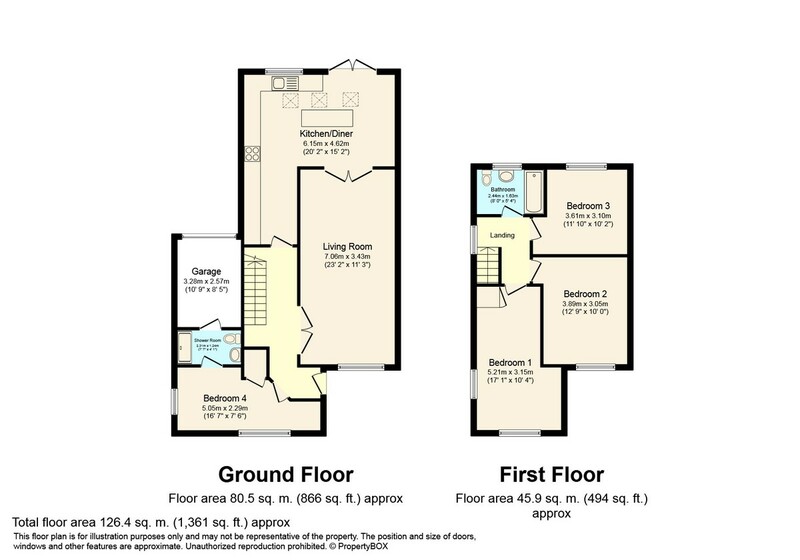 To the First Floor of this extended home is a Family Bathroom and three fantastic double Bedrooms. OUTSIDE This wonderful property has been extended to the front and rear, and is set back from the road with a recently laid driveway providing off street parking for three cars. There is also a garage with an up and over door attached to the property, which is accessed via the Rear, that is where you will also find the gate, which opens into the Rear Garden. The Rear Garden is a blank canvas, currently laid to lawn, but offering the next owner the opportunity to personalise.